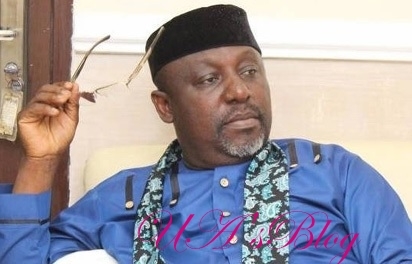 Imo governor, Rochas Okorocha, has expressed grief over the murder of the All Progressives Congress, APC, Chairman in Ideato-North Local Government Area, Sunny Ejeagwu. Okorocha described the incident as a gruesome case of mindless assassination. News Agency of Nigeria reports that the governor spoke when Political and Community leaders of Ideato-North came to officially inform him of the development on Friday in Owerri. Okorocha said that it was not a case of armed robbery as nothing was taken away from the party chieftain or removed from his car. He also dismissed the insinuations that the deceased might have been kidnapped before his murder, as there was no sign of resistance or struggle between the killers and the victim. He said the man’s head and body were shattered with bullets following several gunshots just to make sure that he had no chance of being revived, an act he claimed could only have been carried out and by wicked assassins. The governor assured that the killers of the man, popularly known as Ohaneze, will soon be apprehended and will be made to face the consequences of their wicked act. He further directed the Police and other Security agencies in the state to leave no stone unturned in ensuring that those behind the ungodly act are brought to book without delay. The governor pledged N20 million reward for anyone who would give useful information that could lead to the arrest of the killers.